Some horses are so insecure that they behave as though the best defense is a good offense. ​Andie's heart sank as she drove up to her boarding stable. Once again, she could see that her gelding was in his stall while all the other horses had been turned out in pasture "buddy groups". "We had to bring him in", the stable hand told her when she got out of the car. "He was threatening the other horses and kicking out at them again." The staff at Andie's boarding stable were very knowledgeable, gentle, and extremely competent when handling the horses, so she knew the problem couldn't be that her horse was being badly treated. She also knew that the horses were fed only in their stalls so that no competition for food would take place. The other horses were well-behaved, grazing peacefully together in their buddy groups. 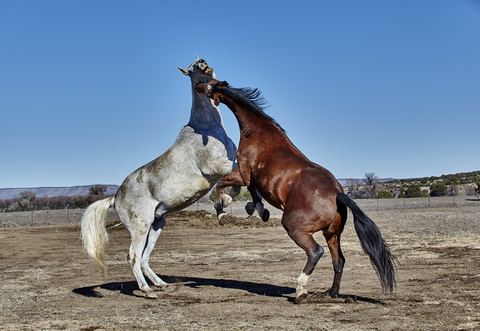 ​Horses that appear to be pasture bullies sometimes aren't bullies at all. They are insecure and easily threatened so they act as though the best defense is a good offense. Her gelding wasn't a bully when it came to people. He was gentle and responsive to Andie, winning her many a ribbon at shows. He was kind and cooperative with the stable staff. But around other horses, he was a nightmare. In the pasture, he behaved like a bully. If any horse got near him, he pinned his ears, bared his teeth, and kicked out at them. Sometimes, he reared up and struck out with his front feet like something straight out of a nature show. When trail-riding, he showed the same pattern. When he and Andie rode alone on the trail, he was calm and sweet-tempered. But if Andie tried to trail-ride with her friends and their horses, her gelding was a handful. He pinned his ears and kicked if any horse got close. When Andie rode in the arena, the same thing happened: He was fine if they were alone, but he became fidgety and reactive if there were other riders. Even in his stall, he would rear up during feeding time, charging at the horses in the stalls on either side of him to make sure they didn't somehow get his food. In my experience, horses that show this particular pattern of aggressiveness aren't bullies at all. They are insecure and easily threatened. And when they feel threatened, they act as though they believe the best defense is a good offense. Other horses instinctively seem to know how to find their place in their buddy group hierarchy. They may challenge and test the boundaries when new members join the group, but everyone quickly settles down into their place. They know when to move away from a dominant who is approaching, or how to allow subordinates to approach and graze nearby without incident. But Andie's horse is a different kind of animal. For whatever reason, horses like this always feel threatened by other horses. They don't seem to get the rules of the social hierarchy. So they find themselves always feeling threatened and confused by other horses around them. In my experience, the best way to deal with horses like this is to find a buddy group for them that they find completely nonthreatening. Over time, they become more confident and cooperative, and seem to acquire better skills for "reading" the intentions and behavior of other horses. The fictional boarder, Andie, is loosely based a boarder who owned a very large eventing thoroughbred gelding at our facility. His owner wanted him turned out alone, yet we often saw him standing near the fence gazing out at the other horses in groups. She said that it was dangerous to turn him out because he always seemed to get into fights. With her permission, we introduced him to a buddy group consisting of a calm, older 16.3hh warmblood mare and a small 14.2hh thoroughbred filly. It worked. The females were curious about him, but not particularly threatened. The older mare was calm and respectful, giving him his space and watching him from a distance unless he wanted to approach her. The filly was frisky but so obviously non-threatening that the gelding actually played with her. He became calmer and more secure around other horses in the barn, at shows, on the trail, and in the arena. It was almost as though having that little "harem" of his own made him feel secure enough to venture out into the world without seeing "boogie men" out to get him everywhere. One word of caution, though: When the gelding's owner moved away and took him to a new facility, she decided he was "all better now" and could be turned out with other horses. But the first day he was turned out, he got into a major fight with two other horses and was so seriously injured that he needed an entire show season to recuperate. The lesson we all took away from that story was that sensitive, insecure horses like this need to be kept in social environments that allow them to feel safe and competent. Wondercide Natural Cedar and Lemongrass Flea and Tick Spray for Pets also works great as a fly spray for horses! Repels biting flies and other annoying insects.